PC version includes additional system voices, more. The PC version of BlazBlue: Chrono Phantasma Extend will launch via Steam on March 2, publisher H2 Interactive announced. Get full information about the PC version below, via H2. BlazBlue: Chronophantasma Extend is the sixth installment of the BlazBlue series, a combination of 2D fighting action game and visual novel. With two new characters, Celica and Λ-11-, joining the roster, the player will be able to choose from 28 different playable characters. This is the complete version of Chronophantasma series with many new features! This PC version officially supports English, Japanese, Chinese, and Korean. Also, Chronophantasma (CP) mode is available for players who wish to play in the previous balances. “CP” mode is PC exclusive feature and only available in the following game modes: VS, Training and Player match (Network). My Room: A totally new system, ‘My Room’ has been added to the existing BlazBlue network system. In the room, you can talk with other players and decorate your room with wall items, furniture items and etc. You can even fight with other players as a team in Team Match. Crush ‘Em! : With the all-new revamped Guard Gauge system, players can now determine when to attack/block using the Barrier Gauge meter. When your opponent’s Barrier Gauge meter is depleted, unleash a powerful barrier-shattering move, Guard Crush! Ready to Fight with Style? : With Stylish Mode activated, even beginners can perform flashy attacks and combos! Four new features have been added to Stylish Mode: Auto Guard, Combo Attacks, Special Abilities, and Distortion Drive. These features allow players that are new to fighting games to pull off advanced combos! New Stage, Characters and Additional Scenarios! : There will be a total of 28 playable characters with two new exciting characters, Celica and Λ-11-! 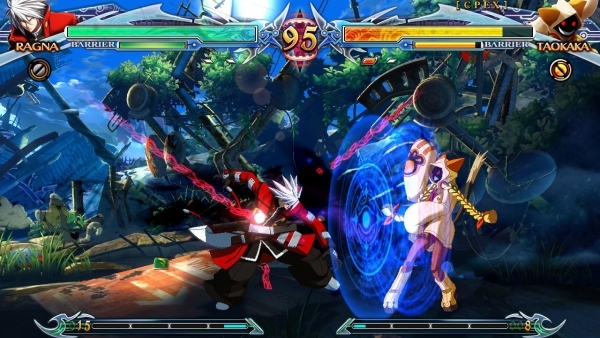 BlazBlue: Chronophantasma Extend includes brand new scenarios and contains digest versions of BlazBlue: Calamity Trigger and BlazBlue: Continuum Shift, so both new and returning players can enjoy the Story Mode. Celica also comes with a brand new stage, Ishana, the land of memories! Remix Heart and Gag Scenarios: Tired from all that fighting? Take a break and enjoy a heart-warming comedic story (mode) featuring two high school girls, Mai Natsume and Kajun Faycott, as well as the characters from the main scenario, Noel, Tsubaki, and Makoto! There are newly created 8 additional gag scenarios you can enjoy as well. System voice: Additional selectable System voices, featuring Mai Natsume and Kajun Faycott. ‘My room’ item pack A, B, C, D: Total of 28 characters’ worth of in-game posters and Blue Radio mats. 8-bit Character avatars: ‘XBLAZE Lost Memories‘ Set. Digital Original Sound Track containing 12 special music tracks. View a set of screenshots from the PC version at the gallery.